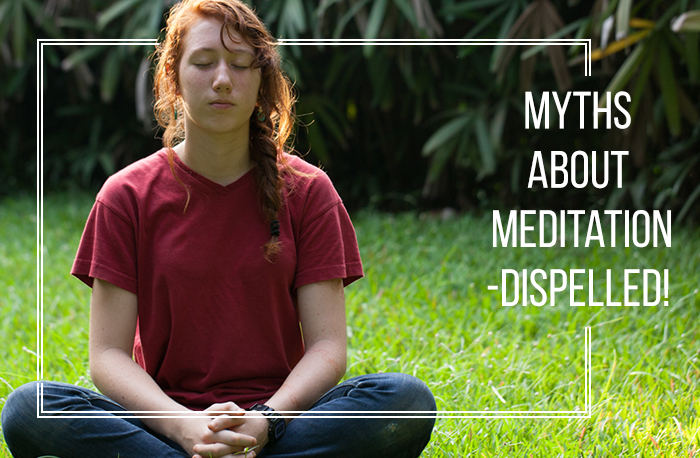 Myths about meditation – dispelled! Religions include meditation as a practice, but meditation is not religious, per se. According to Jay Michaelson of the University of Southern California, “Meditation is not religion, not spirituality – it’s a technology of upgrading the mind that can enrich one’s life, including one’s religious life.” While we have been very particular about physical fitness and worried about our EQ, it is time we paid attention to ‘contemplative fitness’ as well. The practice or ‘technology’ of meditation includes a myriad of methods used to observe, quieten and train the monkey mind. There is compelling evidence for the positive effects meditation has on our mental and physical lives. The structure of the brain is known to change after as little as 8 weeks of meditation. We meditate to enrich our lives, to realize our fullest potential and help us enjoy our present life. It is not necessary to believe in God or be affiliated with a religion. Most people who meditate today do it to be healthy and happy. Meditation helps you to know yourself, your attitudes, your habitual ways of reacting which contribute to your problems. Meditation helps you to see things more clearly and actually deal with problems with equanimity, in a more insightful and accomplished manner. It also gives you a sense of calm that helps you to take life as it comes. You understand the need to take one step at a time and not unduly worry about the future. You develop inner strength and self-esteem that empower you to see situations in a different light and think out of the box. Optimism, confidence and high energy levels mark a meditator. Studies have clinically proven the higher emotional intelligence of meditators. So, far from running away from problems, people who practice mediation actually tackle problems head on! Children at school, teenagers in college, and young adults in demanding professions perhaps benefit the most from meditation. My son began his practice when he was only 18. When I see him and other young meditators, I find them so very centered, confident and calm. I admit to feelings of envy. If I had been able to start early, I am sure my life would have taken a different turn altogether. suspensions fell by 45 percent. daily attendance climbed up to 98 percent. grade point averages improved remarkably. Young adults gain skills to live happy lives and realise their potential talents. Young people have reported that they learn to control their anger, be more positive and spread such feelings around them, and remain calm even in stressful situations. Attitudes engendered by meditation have a positive spillover in professional life as well. Robert W. Coleman Elementary School, Baltimore, sends unruly children to a Mindful Moment Room instead of sending them to the Principal or to detention. The results have been stunning. Flashes of blinding lights, celestial music, going through a lighted tunnel, levitation, bright colors, and visions of Gods are experiences that some people expect during meditation. You may have a variety of experiences – losing sense of time and space, deep calm – but it is also not necessary that you experience these, nor should you aim for these. The objective of meditation varies, but is often to quieten the mind, find peace, heighten awareness, be in the present, be calm and kind. Thoughts come and go, and in meditation we witness the thoughts and learn to ignore them. Eventually, we transcend thoughts and move to a deep inner silent space. The idea is not to identify with thoughts and not to get disturbed by them. We do not discriminate between good and bad thoughts or try to drive them away. “The thought I’m having thoughts may be the most important thought you have ever thought, because before you had that thought, you may not have even known you were having thoughts. You probably thought you were your thoughts,” says Dr. David Simon, co-founder, Chopra Centre. Some types of meditation advise practioners to be present and mindful of thoughts as they arise, as part of the practice. When we are able to merely observe our thought process and emotions, we can defuse the ever-rising stress, but when we try to control thoughts we do just the opposite. The most common image that we all have of a meditating person is the lotus posture, spine straight, palms upturned on the knees and eyes gently closed. It is not necessary to meditate in this pose. We can sit how we are most comfortable – cross-legged on the floor or on a chair or a sofa. What is important is to be inward-focused and at ease, so that we aren’t constantly thinking about the way we are seated. Please don’t lie down or you might doze off! Spiritual guides today advocate 20-30 minutes of meditation once or twice a day. With the support of Transmission, it is possible to delve deep within and make that wonderful inward journey which is spiritually nourishing. On the contrary, meditation techniques are easy and simple to learn and practice. Meditation is a process of creating and increasing self-awareness and molding character. If you expect special experiences, then meditation will be difficult. If you understand that meditation is a journey to be savored and the results will appear on their own, meditation will not be difficult. It is true, that to become an adept at anything – whether a musician, a chef, an engineer or a doctor – you have to practice and keep at it. Yet, learning to go deep in meditation actually takes little time, especially with the support of Transmission. Many people are put off by the idea of having to follow rituals but most meditation practices today do not require them. You may light an incense stick, play soft music to create the atmosphere, wear certain clothes, or recite a mantra, but meditation dos not require these external elements; it is an inner activity. Initially, I began my meditation practice with beads and incense sticks. I did this for three years. Later, I moved on to Heartfulness Meditation which does not require any external element. It is a connection between me and the universe. Actually, meditation has been around for thousands for years and the benefits are so far-reaching on the physical, mental and spiritual level that it may remain for many thousands of years to come. When you are hypnotized, you’ll be unaware of what is happening around you, whereas meditation makes you more sensitive and aware, providing you a fresh insight into reality. Meditation expands your consciousness and calms the mind. I invite you to listen to a talk by Dr P Nandi to dispel any further doubts you may have. There are many, many methods of meditation available, so choose the one you find suitable; growing evidence suggests that it will make a BIG difference to your life.